A Journey of Reinvention: "Trust the Engineer"
I've decided that it's all about the vantage point in this world. For all the things I can see, there are far more things I cannot see. Circumstances, history, future -- all of these play a part in the path I am to travel in life, and they shape the Journey far more than my current situation and surroundings. With my eyes closed in the morning, I can still feel a small dog walking across my chest, and I know that his warm, disgusting breath in my face means that he's happy to see me, and I need to get up because he has to go outside. I don't have to see him to know all of that to be true, it just is. Having flown several times since then, I have much less trepidation. I see more than I did then. I now have some understanding that it is not necessarily the pilot who is in charge so much... there are air traffic controllers who have a much better vantage point. If it were up to the pilot to fly the plane only by what he/she saw, we'd have crashes galore. You can't see through clouds. You don't have a clear view far enough in front or to the side to know where anything else might be. You can't take off or land such a gigantic monstrosity as an airplane without MORE than what meets your eye. You have to have someone with a much bigger and broader vantage point guiding you every step of the way. Telling you where to set your course, when to move, what direction you should be going right now and what direction you will be going soon. Above all, you have to listen even when it seems like what you are seeing at the time doesn't gel with what you are hearing. You have to listen, and follow, every direction you are getting from the tower. Yep, I'm relating it back to God. Don't I always? Heh. I have been in some terrible situations in my life. Things that are horrific. Things that make absolutely no sense whatsoever. Things I cannot foresee my way out of. Mistakes I have made, problems others have caused that I am stuck with, muck and mire beyond comprehension. I have to continuously remind myself that there is a higher vantage point, and I cannot guide myself out of this mess without listening to every instruction from above and following it to the letter. I cannot save myself. I've never been able to in the past, and I'll never be able to in the future. I can only see what has been and part of what is now, but I cannot see the whole of things as they stand in relation to past, present, future, and eternity. 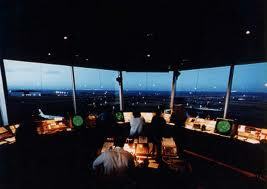 There is only one Air Traffic Controller that can do that, and when He speaks, I should really, really pay attention. That's the meaning behind the pithy, overused phrase 'Let go and let God'. Sometimes there are adages for a reason. When I find myself in a situation where I have exhausted my resources and talents and abilities, when there is no foreseeable way out, where I cannot continue on the course I've taken without correction, I have to take direction from the big ATC in the sky. He can see it all -- not just my life, but every life of everyone who has ever lived and will ever live. He sees how it all fits together in perfectly woven tapestry where, if one string is out of place, the picture goes out of whack. He sees how it all gels together in a masterfully crafted jigsaw puzzle where, if just one piece is missing, none of it was worth anything to begin with. Each of us has a purpose, and our job is to let Him direct that purpose every step of the way so it comes to the most beautiful fruition it possibly can. Even when the train goes through a tunnel and things seem so dark you can't imagine the light once again, hold on -- the Engineer knows what He's doing. Even when the plane suddenly drops and your stomach does flip-flops, don't just trust the pilot -- trust the Air Traffic Controller. Even when your life is so dismal you can barely get up in the morning to trudge through another day, don't let the bleakness get you down. Trust God, because He has a plan for your life -- "...plans to prosper, and not to harm you, plans to give you a hope and a future" (Jer. 29:11). Trust the One with the highest vantage point. You'll never be sorry you did. This is another test of the test. Which means, you've officially published four comments on one blog! YAY WILLIAM! :) It's good to have you back! Thank you, darling Kris. I appreciate YOU, more than you know! Praying for you, as always.